These two items have been finished for a while and I’ve just been lazy about getting them photographed and loaded onto the computer. 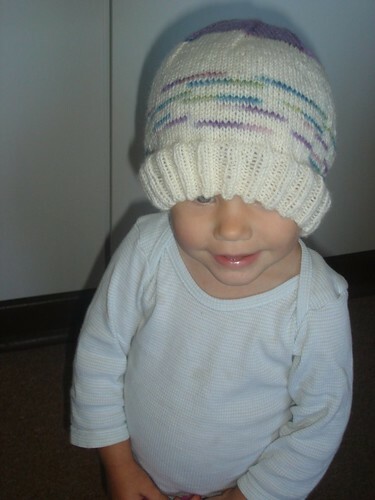 First, Yet Another Hat for Charity, modelled by my Gorgeous Girl, who, I just realised, has Marmite on her face. (Aside: we have nearly finished the Australian jar and I’m going to have to resort to the British recipie 😦 No love to the 12 year old customs agent who confiscated my three jars on our last visit – I forgot that you can’t take gels on board). 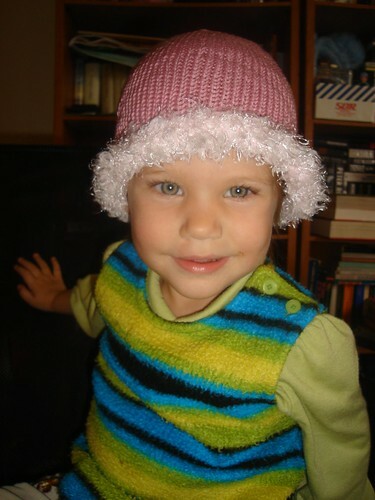 After trying this one on for me she asked me to make her a hat, so I showed her my handspun and got her to choose the colour she wanted. That hat is over halfway done, so I should have another FO soon. 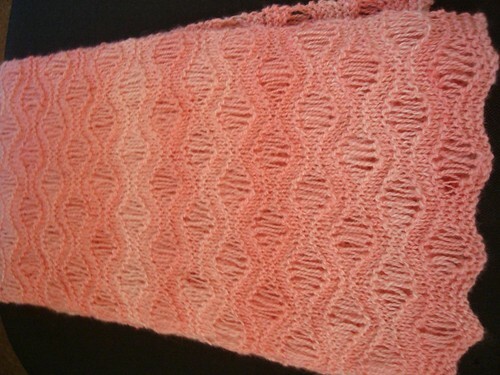 Morning Surf Scarf 3 (this one for me!) is done. I think I have one more of these still to knit. The garden is going well. The tomato plants are pumping out the cherry tomatoes. 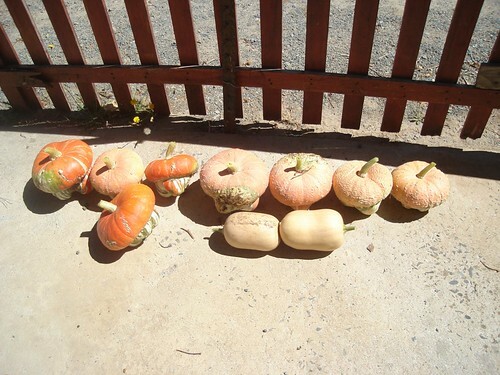 We haven’t had any ripe larger ones yet, but they are plumping up nicely. The corn was a complete bust though. Really hard and not tasty – we’ve grown good corn before, this was a new variety for us, so we’ll try a different one next year. 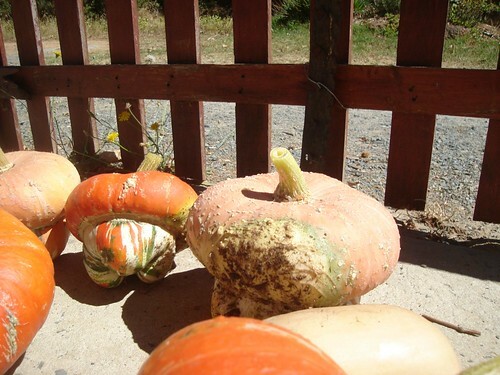 We harvested the pumpkins on Sunday. 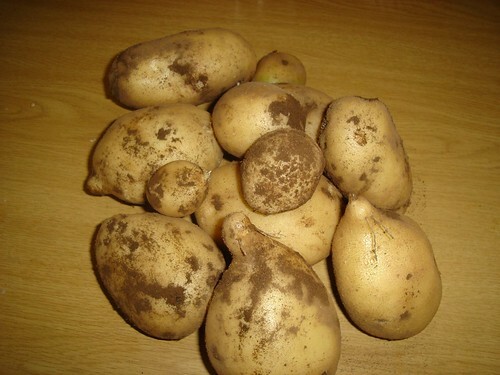 There are two varieties here. I think we’ll get at least another 7 butternuts from the vines. 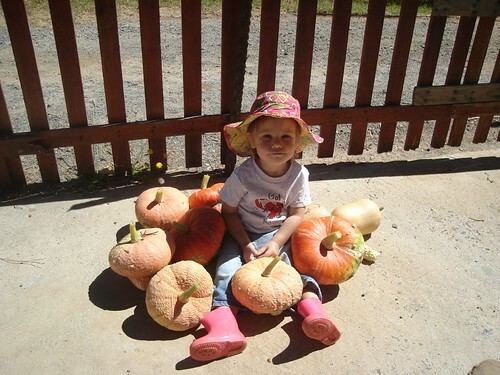 She has become quite enamoured with taking pictures lately, her is one of her “Pumpkin Series”. I do have a very simple point and shoot camera, but I’m still impressed that she can hold it steady. We are hoping to take a small trip (for both work and pleasure), so I’ve been creating a travel journal before we leave. That way I can journal there, and just add pictures when I get home. 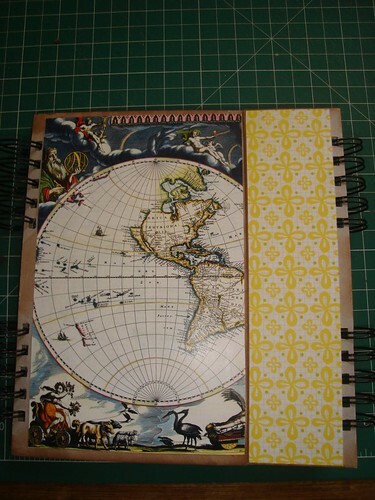 The main paper came from my 2006 diary which had pictures of old maps through it. 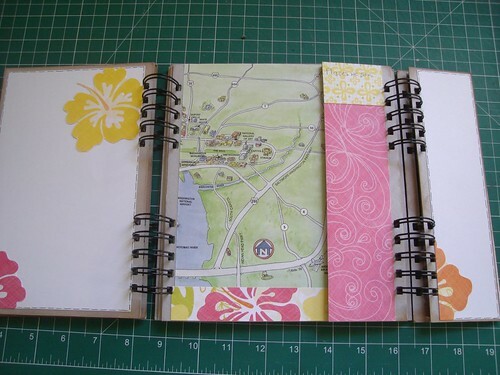 I tore out all the maps before tossing the diary (I’m embarrassed to tell you that I only go around to doing that last week). Once I know exact dates I’ll add the dates and location(s) to the yellow paper. This is the first page spread. Kerin, do you recognise the paper on the left? 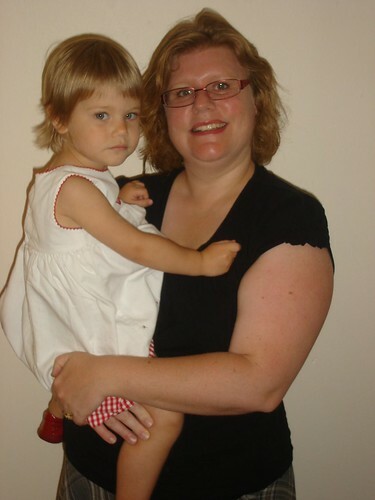 We bought it when I stopped in Perth on my way to South Africa in 2006 – left over from other projects. The map is of one of the places where we are going. And, that’s as far as I got. I go back to work tomorrow, so crafting is going to slow down considerably. On Saturday I was taking pictures of Araminta, when Gorgeous Man suggested pictures of the two of us. So here is a rare one of me. We have finally introduced Gorgeous Girl to the ‘one-eyed monster that lives in the corner of the room’. We’ve been playing her a children’s DVD. We know one of the presenters and it’s fun to see him and his kids (his wife, one of my good friends, even makes a cameo appearance now and then and I get very excited). Even so, it’s scary how much she loves the TV – she calls it “DVDTVD”. Finally, Happy Australia Day to all my Aussie buddies. This year is the first year I haven’t had to work on our national holiday. 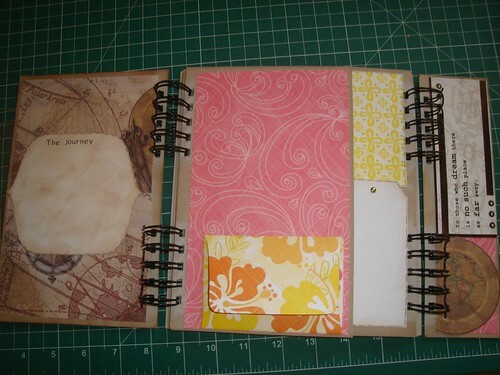 This post is mostly for my friend Kerin, who is a wonderful scrap booker and who got me started on the whole process. I was inspired by my class last week to do a few more pages. This is in Gorgeous Girl’s 8 x 8 album. I started with the 8 inch album because I was worried about filling up 12 inches of space. I bought this owl paper in Australia, because I just loved it, but couldn’t work out a way to use it. The teacher at the class had a few ideas that I liked and she drew me a rough sketch that I finished off when I got home. Might add a bit more to this page, not sure yet. I don’t like overly busy pages. 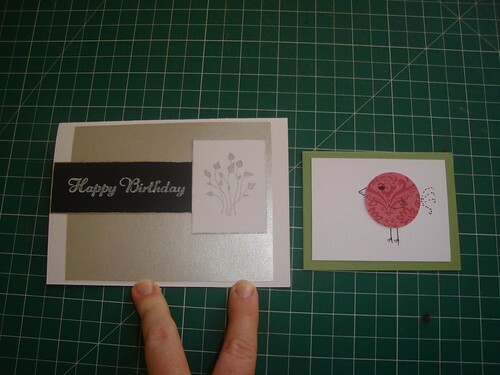 While I had the papers out I made a few cards. So this year I have written all of the birthdays on the wall calendar and in my diary (didn’t use a diary last year, tried to go digital, not my greatest success). In addition to that, about 2 and 1/2 weeks before the actual birthday I’ve written a note in my diary to “post card for X”. Hopefully this, along with a ready made stash of cards, will help matters. The young lady that watches Gorgeous Girl for us in the afternoons is back from her holiday, so Gorgeous Man and I went and saw Avat*r in 3D this morning. It was a great movie, but the whole experience reminded me how much I hate going to the cinema in South Africa. First there were problems with the EFTPOS machines, and so when the guy behind the counter saw I had cash he motioned me to the head of the queue. Well, that set the ‘gentleman’ in front of me off as he was also wanting to pay cash. So I apologised profusely and let him go first. But the biggest issue is that cinemas here have set seats and this time I couldn’t find our seat numbers on the ticket. The cinema was 3/4 empty (morning session on a work day) so we just sat in a spot. WELL, was that an issue! One couple got so aggressive about the fact that we were sitting in the wrong seats. Gorgeous Man decoded the ticket and found where we were meant to be sitting, and we were able to relocate before the movie started. But, for crying out loud, it’s just a seat in a cinema people! And it’s not like the cinema was full in any way shape or form. If we hadn’t wanted to see it in 3D we probably would have just waited until it came out on DVD and avoided the whole cinematic experience. 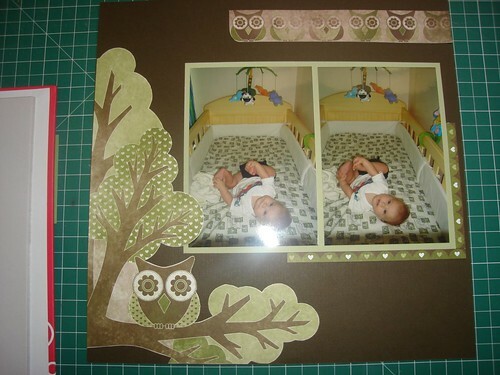 I have another scrapbooking class tonight, last one I’m able to do as I return to work next week. My holidays are almost over. After much consideration I have decided against hand-quilting the fish quilt, so it is unbasted and waiting to go to the long-armer. I have to wait a while in terms of my budget to fit that in though. In the meantime, I’ve switched my leaders and enders project to my main project and hope to have some progress on that one to show you soon. On Tuesday Gorgeous Man and I celebrated our wedding anniversary. We went to a lovely restaurant – the food was fabulous. We sat by big open windows and had a stunning view of the sun setting over Table Mountain in the distance. 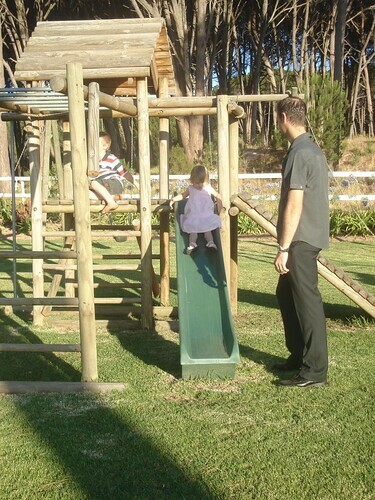 Gorgeous Girl was very impressed with the playground. 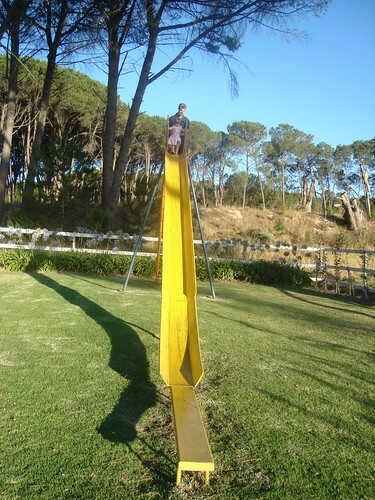 First, she went on the kiddy slide. 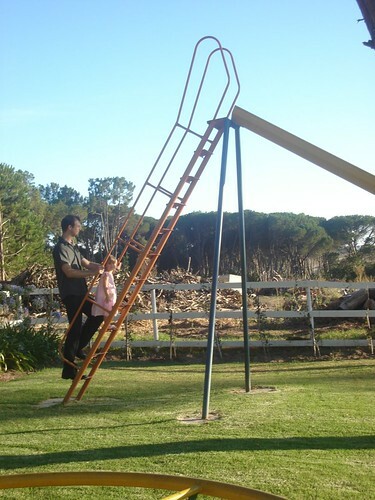 And that was fine, until she spotted the “Slide of Doom”. Yes, it is as tall as it looks. Gorgeous Man went up the ladder behind her, but she climbed the whole way by herself. It was fun to see Gorgeous Man sliding down with her. 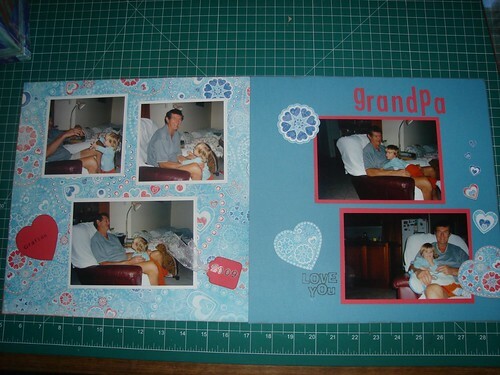 I’ve been working on Gorgeous Girl’s scrapbook. This was an experiment I tried. Using plain white and cutting out motifs from the patterned paper. I then took a class on Wednesday last week and this was the layout. Patterned paper is quite expensive here, compared to Australia and the USA, so I can see more of this type of scrapping in my future. I have done two more layouts since the class that have employed this technique. Occasionally Gorgeous Man will stumble upon tutorials online that he sends me the link to. This skirt is the result of one of those emails. Through no fault of the tutorial, it didn’t turn out that great, and looks kind of handmade, but it’s OK for around the house in the very hot weather we have been having. 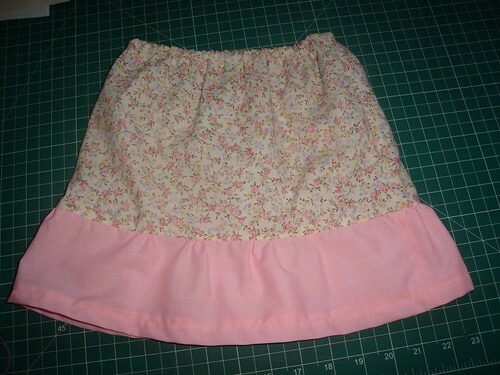 I had problems hemming it after I had sewn the two pieces together. The fabric came from stash (part of my inherited stash, so I don’t feel too badly that it didn’t work out super great). I think if I do this again with good fabric I will hem the bottom piece before attaching it. There has been more spinning. This is 100% merino, and was part of my December fibre club shipment. 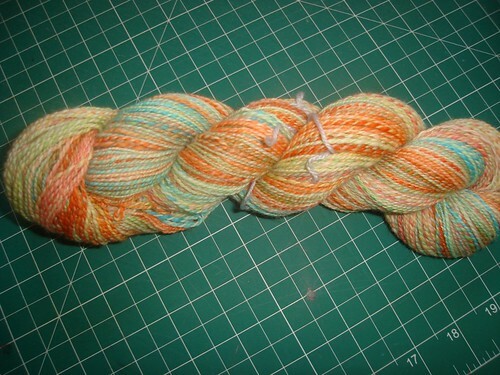 This is available for trade, I’m willing to trade handspun, fibre or commercial yarn. There’s nothing wrong with the yarn, just not colours that I know I will ever use. So if you would like this to come and live with you, make me an offer. 🙂 I will insist that you wait until it arrives to you before you post anything, so that if SA post does the dodgy, then only one of us is out of pocket. Kerin if you like this, let me know and I’ll knit it into more fingerless gloves for you. Finally, a charity hat. I’ve been sticking to my “Fridays are for Charity knitting” plan so far this year and have been finding that it’s a great way to use up bits and pieces in the stash and I’m getting a fair bit made as well. I’m on leave at present and am enjoying a greatly reduced pace of life. Yesterday I took a scrapbooking class and had a pedicure. Today I took Gorgeous Girl to the library and had a quiet day at home. I do have some finishes to show, some successful and some not so much. We are having MAJOR problems with our email at the moment, and I have lost all email sent to me this year, so if you have emailed me about anything important, please resend it. 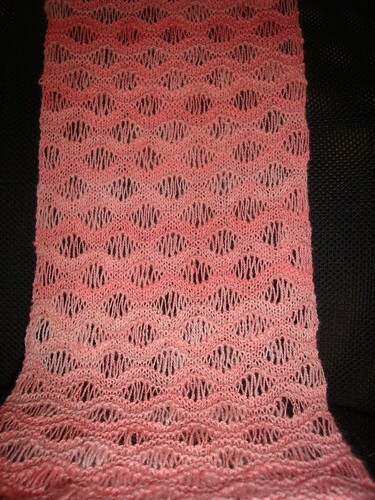 I have a knitting finish. Morning Surf Scarf in my hand-dyed, handspun yarn. I’m so proud of how this turned out! 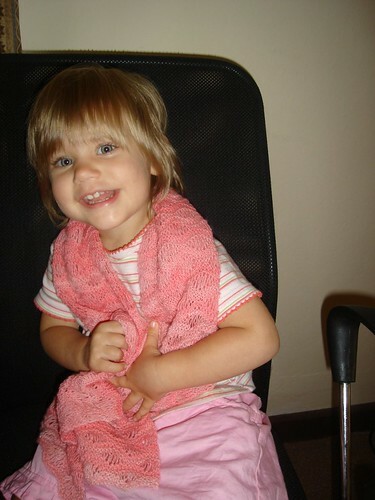 Gorgeous Girl is a tad scarf obsessed at the moment (she turns clothes and fabric into scarves – shame it’s the height of summer…) and she just had to try it on. I’m giving this to a friend, I hope she likes it. I have enough yarn left over (I hope) to make one for me. I don’t usually make the same project back to back, but I’ve cast on for mine already. The bounty from the garden continues, last night for dinner the only thing on the plate that had been purchased was the sausages. Gorgeous Man and Gorgeous Girl dug up one potato bush. This was the haul. They are really yummy. Also an heirloom variety, but I forget the name. 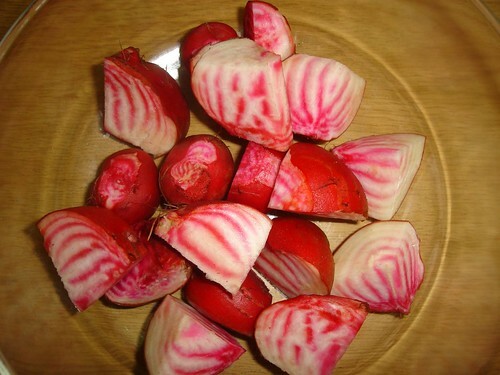 Here is the candy striped beetroot ready to be covered in olive oil and roasted. After cooking the beetroot was skinned and tossed in a garden salad. 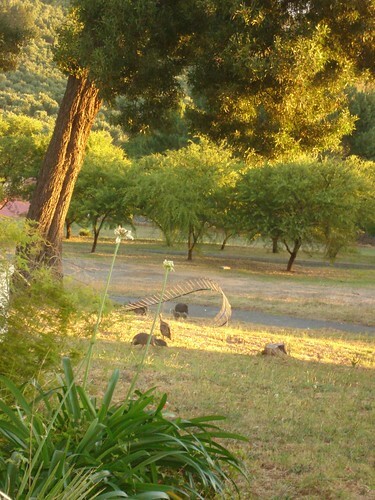 This year, for the first time, the guinea fowl who frequent our yard have a large brood of chicks. It’s been really fun watching the tiny little babies turn into adolescents. Here is a really bad shot of them, but is the best I can get. They are really skittish! This is our front yard. The wire will eventually become part of a chook (chicken) coop. The photo is not crooked, my front yard does slope that much. We had Christmas Round Two today as some cards and parcels from Grandparents and Uncles and Aunties in Australia arrived today. Gorgeous Girl is thrilled with her new handbag and book. Because of the way the postal system works (or rather doesn’t) she thinks that all major celebrations like birthdays and Christmas are extended celebrations. I’ve been clearing up my craft room. The yarn/fibre stash is organised, I’ve sorted out the scrapbooking area (which is the top of a chest of drawers on which I store my supplies). Right now I’m working on the sewing table, which has turned into such a mess that I can hardly reach the sewing machine. I’ve made a promise to myself to keep the other desk in the room clear so that I can work without clearing it off first. Two weeks in, so far so good, and I’m finding it does increase my productivity if I don’t have to clear up junk before cutting out fabric or making a card. What kickstarted the spring cleaning was a certain Gorgeous Man who signed me up for Library Thing. His Christmas present to me was to catalogue my entire collection of History books, which meant that the overfilled bookshelf was sorted out and tidied up. He banned me from my craft room for three days while he worked on it. Thank you for all the well wishes for Gorgeous Man. The antibiotics are working and he is feeling much better.